The Renault Kangoo Z.E has recently be joined by the larger Master Z.E, giving Renault a two pronged EV van attack. We recently drove the Master Z.E. & with a range of 50-75 miles depending on the temperature outside, it offers businesses a useful electric range & load capacity. The Kangoo Z.E. however, is claimed to have a realistic range of 120 miles in Summer, on a single charge, making it distance wise anyway, a lot more practical. 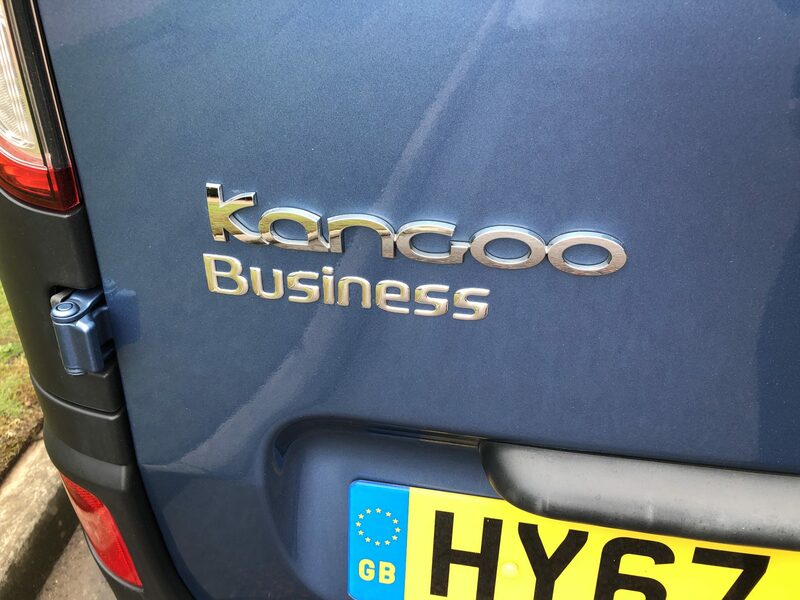 A standard panel van in Business spec made it’s way to our offices recently, giving us the opportunity to see if the Kangoo E.V. will do what it says on the tin. 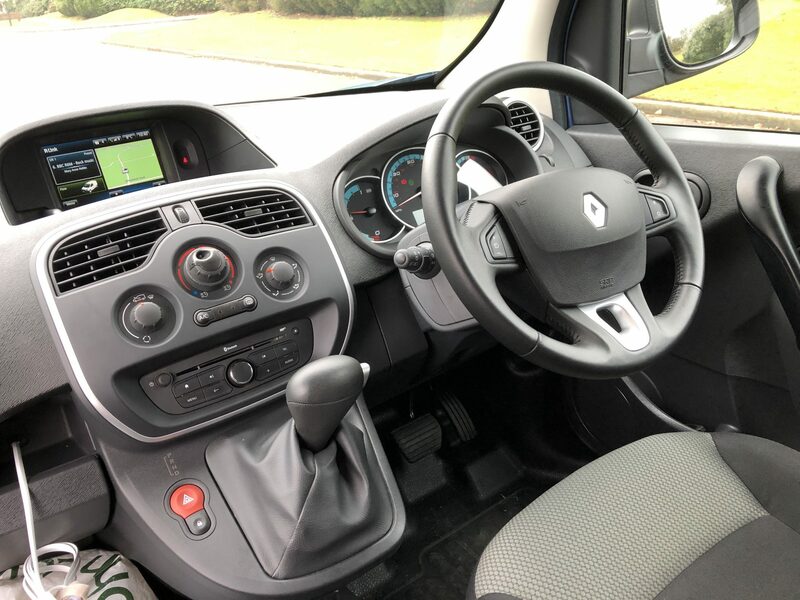 Officially, the 2017 Kangoo Z.E has an all-electric range of 170 miles, but those ever honest people at Renault, have publicly admitted that a driver can expect the Kangoo to cover 75 miles in the Winter or 124 miles in the Summer on a single charge, which is an improvement over the previous version which offered only 50 & 78 miles. As far as practicality goes, the Kangoo Z.E. is available in two load lengths standard or Maxi & can also be specified as a two-seater panel van or as a crew cab with five seats. In its largest form, the Kangoo van will provide 4.6 cubic metres of space, with a load length of 2.1 metres. Specify the optional folding front passenger seat & this increases to 2.8 metres & you can also add a roof hatch for carrying ladders. 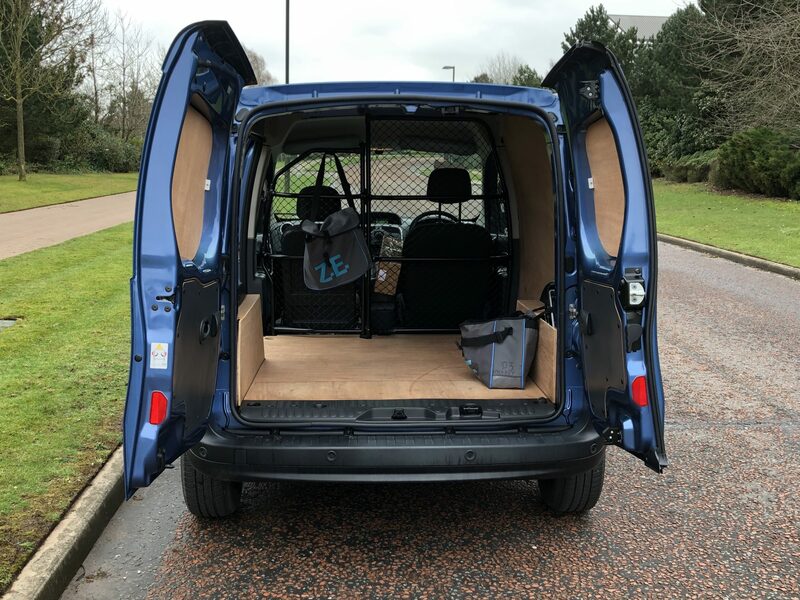 Our test model, the standard panel van in Business spec featured a mesh swing bulkhead, a left hand sliding side door, twin 180 degree opening rear doors & a ply lined loadspace. The external wing mirrors are large, allowing a good view both to the side & behind the van. Climb aboard & the cabin is pleasantly spacious, with especially good head room. Both driver & front seat passenger also get decent leg room & for practical purposes, there’s some useful storage space as well. The door pockets will take a couple of bottles each & there are a couple more cup holders in the centre binnacle, although one of these is awkwardly located under the airplane-style handbrake lever. The ECO button is also located down there. There’s also a useful covered cubby that can also be used as an armrest. The steering wheel features buttons to select cruise control with limiter. The lights are located on the left stalk & the wipers on the right stalk. On the right hand side of the steering column there’s a volume control wheel to scroll through the infotainment options & volume control The infotainment system also features Bluetooth, which I used to connect my iPhone. Kangoo Z.E. also features rear parking sensors, rain & light sensors. In all honesty, even though it’s well equipped, just like the diesel Kangoo & Mercedes-Benz Citan based on the Kangoo, it’s showing it’s age, especially when compared to the latest offerings from the PSA Group with Berlingo, Combo & Partner & Ford with the Transit Courier. Although the Kangoo E.V. has the same load space as the diesel version, with 3.0-4.6 cubic metres of capacity, due to the additional weight of the battery pack which os locate underneath the load floor, the payload of the Kangoo Z.E. 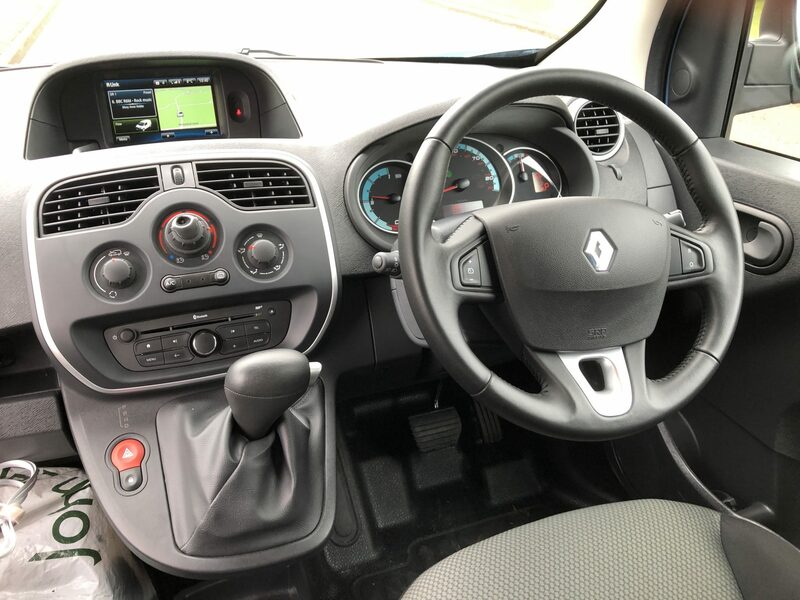 in both standard & Maxi versions, is limited to 640kg, whereas the standard Kangoo offers 800kg. The battery also adds some serious weight to the Kangoo, increasing the kerb weight by 130kg compared to the standard van. That’s the equivalent weight of almost two adults. Renault use a 33kWh battery, which is linked to a 44kW electric motor to produce 60PS. This means that wit such a low output the Kangoo Z.E. is incredibly sluggish on the motorway. We drove the Z.E. on a 55 mile motorway trip at around 60-65mph, half of this into a head wind. Our fully charged van used a half of it’s charge in the first 30 miles & then on the return another half of what remained in 25 miles, giving the Kangoo Z.E. a Winter range on our trial of about 70 miles. Furthermore, with the mesh bulkhead fitted to our teat van & low rolling resistance tyres, the cabin is also noisy on the motorway, especially in the wet & unladen. There is some energy regeneration on offer, which comes when you take your foot of the accelerator, but of course, on a motorway this doesn’t happen. You can though utilise this driving in town. If you select Eco mode, this modifies throttle response & power unit mapping, delivering up to 10% more driving range. The Eco function acts upon certain power consuming systems in the vehicle (heating, air conditioning, power-assisted steering etc.) & on certain driving actions (acceleration, cruise control, deceleration etc.) On our test it seemed to limit the Kangoo’s maximum speed on the motorway to around 55mph as well. It’s not all bad though. I drove home & plugged the cable into the front of the van & into our Rolec charger & left it to charge for 4 hours & 40 minutes to reach full charge. Recharging the battery from zero takes around six hours from a 7kW wallbox & 22 miles of range can be added from one hours charge. The following day I took the Kangoo out on local, urban roads & it’s here that it really belongs. It’s nimble in traffic, offers responsive steering & utilising the Eco button, managed to improve the economy considerably. It’s a rich to drive in town & feels a bit like driving a dodgem car- you push the starter button, release the hand brake, press the accelerator & move off silently- & it’s perfect for short, urban distances. The Z.E. features voice function, which emits a sound to warn pedestrians that your van is coming which is active between 0.6 & 18.6mph. 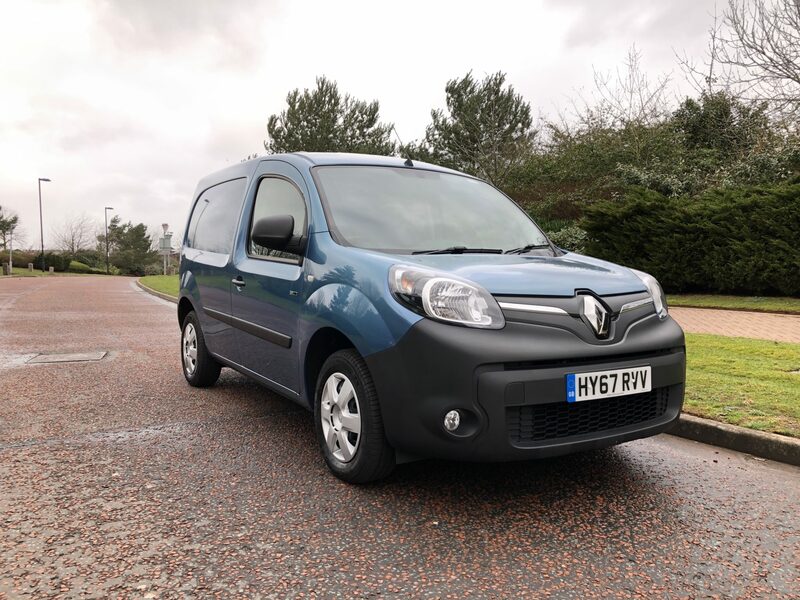 Despite the fact that the Kangoo Z.E’s range may suffer if you use the motorway, or at least drive over 60mph, in all other driving environments it’s really quite good. Simple to drive, easy to manoeuvre, cheap to run, what’s not to like ? Yes you need a charger either at work or at home, or both, to take advantage of the battery, it doesn’t offer as large a payload as it’s diesel brethren & the interiors feeling dated, but as an electric small van operating in urban areas, it’s hard to fault. If you’re a small business that needs an urban delivery van on your fleet, then the Kangoo Z.E. is the one to pick.